2 Are Chicken Wings Healthy? 3 Is Mac and Cheese Healthy? 4 Is Chex Mix Healthy? 5 Is Fried Rice Healthy? Chili looks greasy and unhealthy, but looks can be deceiving! Meat and beans in chili are great sources of protein. Most chili recipes also include fiber, vitamin C (from peppers and other vegetables), and iron. Chilies can cause your body’s endorphin and serotonin levels to go up, making you happy. The ingredients in chili also help regulate blood sugar and boost the immune system. It depends. Fried chicken wings covered in fatty sauce are not healthy. However, chicken wings can be prepared in several healthy ways, including steaming, oven-roasting, and grilling. Chicken wings are healthy if not deep-fried and seasoned with unhealthy ingredients. Is Mac and Cheese Healthy? Traditional Mac and Cheese is just some pasta with cheese and cream. These ingredients are natural and healthy (especially if you choose whole-wheat pasta over the white variety). Remember to keep the portion size in moderation. Please note: boxed Mac and Cheese is unhealthy because it is processed and contains artificial flavors and colors. Verdict: Healthy (if home-made, with portion control). Chex Mix is a cereal snack that is high in carbs, fat, salt, and some protein. It is a processed food. Although it is not a terrible snack, we do not recommend eating this every day. Rice is a healthy grain. The amount of oil used to fry rice will dictate whether it should be classified as healthy or not. If you fry the rice at home and minimize the amount of oil used, you are still maintaining the nutritious aspect of the rice, and it remains a healthy food. 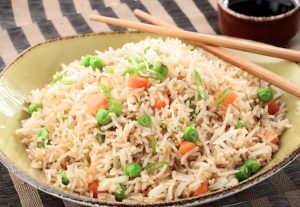 Unfortunately, fried rice bought from restaurants is often soaked or deep-fried in oil, which significantly increases the fat content and renders the rice unhealthy. Verdict: Healthy (if fried in low oil).